Teletalk Oporajita SIM 199 TK Bundle Offer! Hello Dear, Welcome to Teletalk Oporajita SIM 300 Minutes, 2GB Internet & 100 SMS 199 TK Bundle Offer 2018. 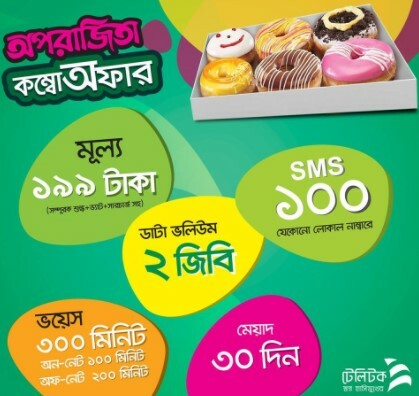 A few months ago, the Bangladesh Government Telecommunication Company “Teletalk” provide a free SIM only for women, whose name is Teletalk Oporajita Prepaid Package. Today, the Teletalk brings a special mixed bundle offer only for Teletalk Oporajita customers. Under this offer, Teletalk Oporajita users are eligible to get 300 Minutes Talk-time (100 Minutes only for Teletalk to Teletalk Number and 200 Minutes any Local Number) + 2GB Internet 24 hours uses time + 100 SMS any local number for 30 days validity at only 199 Taka. All the Teletalk Oporajita Prepaid connection users are eligible to enjoy Teletalk Oporajita 199 Taka Minutes, SMS, Internet Bundle Offer 2018. If you are a Teletalk Oporajita user and want to activate the Teletalk 199 TK Oporajita SIM Bundle Offer 2018, Just follow the below content. To activate the Teletalk Oporajita Prepaid SIM 199 Taka Bundle Offer 2018, Teletalk Oporajita customers need to dial USSD code *111*199#. The Validity of Teletalk 199 Taka Oporajita SIM Bundle Offer, customers need to Dial *152#. Customers use the Teletalk 199 Taka Bundle Offer Minutes, SMS and Internet 24 hours in a day. The Teletalk Oporajita Users activate this Special bundle offer as many times as they want. Thanks for staying with us a long time and visiting Teletalk Oporajita SIM 300 Minutes, 2GB Internet & 100 SMS 199 TK Bundle Offer 2018 content. If you have any question about the Teletalk 199TK Oporajita SIM Bundle Offer? Just comment here, we reply as soon as possible.